The Christian and Missionary Alliance (CMA), an international, evangelical Protestant denomination, traces its origins to the ministry of Albert B. Simpson (1843-1919), a Canadian Presbyterian clergyman who, after serving congregations in Hamilton, Ontario; Louisville, Ky.; and New York City, created an interdenominational missionary society in 1887. The alliance, which remained a society rather than a denomination until 1971, represents an amalgamation of Christians from a variety of ethnic and religious backgrounds. Since 1989 the denomination has been headquartered in Colorado Springs, Colo. As of the early 2000s, the Christian and Missionary Alliance included nearly 2,000 churches with 389,000 members and missionaries in 54 countries. North Carolina, Georgia, and South Carolina comprise the South Atlantic District of the CMA. The district, founded in 1938, initially had its headquarters in High Point, the home of its first superintendent, R. L. Staley. Later, the district moved its central office to Durham and finally to Charlotte, where it remains today. There are approximately 40 CMA groups in North Carolina, including intercultural ministries. The oldest active congregations include First Alliance, Winston-Salem (1888); Durham Alliance (1889); Lumberton Newgate Community Church (1899); First Alliance, Asheville (1927); High Point Christian Community (1931); Reidsville Alliance (1940); First Alliance, Raleigh (1940); Lumberton Mt. Haven Alliance (1940); and Wilmington Alliance (1944). Golden Valley (Rutherford County) Academy, founded in 1907 by R. A. Forrest, was the initial predecessor of Toccoa Falls College, a fully accredited institution located in northern Georgia. The CMA also established youth camps at Deep River (Randolph County), Lo-Ma-Co (Asheville area), and Toccoa Falls. The CMA has sponsored ministries for minorities in North Carolina for more than a century. As early as 1900, the society enlisted the services of African American evangelist E. M. Colette (1852-1923) in order to promote the Gospel among blacks residing in Virginia and North Carolina. In 1906 the alliance established the Lovejoy Missionary School in Mill Springs (Polk County); the institution relocated to Boydton, Va., five years later. The Mary B. Mullen School was founded at Uree (Rutherford County) at about the same time as Lovejoy and remained active through the 1950s. The CMA has also sponsored significant Native American ministries. In 1958 Eugene and Carol Hall were appointed as pastors of the Indian Chapel in Lumberton. As a result of the generosity of benefactor Jane Hargreaves, the service projects of CMA teenagers, and the work of women's groups, the society was able to construct a new facility for this specialized ministry. The Halls served until 1961, after which they were succeeded in turn by Wayne Damron, Lowell Halbert, and, in 1966, J. C. Huggins, the first Native American to pastor what is now the Lumberton Mt. Haven Alliance Church. In the 1980s and 1990s, the CMA began ministering to a growing number of "nontraditional" minorities. Dega (Vietnam) Alliance churches have existed in Charlotte, Greensboro, and Raleigh since 1987. There are Cambodian Alliance missions in Charlotte (1991) and Lexington (1991) and Hmong (Laos) churches in Hickory (1989) and Salisbury (1988). In 1994 the South Atlantic District also inaugurated a ministry in Raleigh for recent arrivals from Zaire. Troy Damron, A Tree God Planted (1982). Robert Niklaus and others, All for Jesus: God at Work in the Christian and Missionary Alliance (1986). Charles H. Williams, Nineteen Eighty Four Report of the Black Field of the Christian and Missionary Alliance. 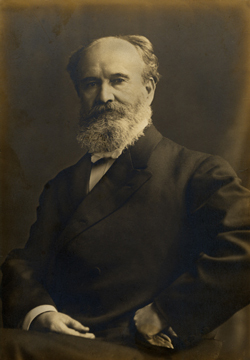 Albert B. Simpson, founder of the Christian and Missionary Alliance. Image available from The Alliance website. Available from http://www.cmalliance.org/about/history/simpson (accessed June 11, 2012). Emily Prudden, a Congregationalist founded Lovejoy in 1903 and deeded it to the CMA in 1905. See her autobiographical sketch in the April 1914, American Missionary, pages 737-743. Thank you for visiting NCpedia and for taking the time to leave your question in a comment. The article you visited – “Christian and Missionary Alliance” – was originally published in the Encyclopedia of North Carolina, published in 2006 by the University of North Carolina Press. It was edited by William S. Powell. And this particular was written by James I. Martin (dated 2006). The University of North Carolina Press has licensed the content of its published volumes the Encyclopedia of North Carolina, the Dictionary of North Carolina Biography, and the North Carolina Gazetteer to NCpedia. If you are looking at an entry from the University of North Carolina Press, you will see the copyright statement from the Press at the top of the page. Please let me know if have additional questions about the permissions or rights for this article or have other questions as well. Thank you again for visiting NCpedia!